He has been repeatedly called "the biggest African footballer of all times", outside of Africa he is seen as the biggest Portuguese player of all times, in his native Mozambique he is considered the shiniest football star the country has ever produced, but regardless of which country or continent can claim Eusébio as "its own", one thing beyond any doubt is that the "Black Panther" has been one of the top figures in the sport's history, and one of the most entertaining to watch. 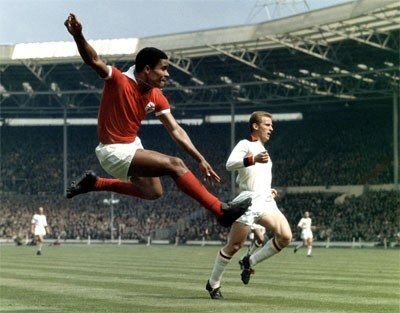 Eusébio at Wembley against Milan, in the European Cup's final in 1963. Eusébio da Silva Ferreira, as was his full name, was born in 1942, in Maputo, Mozambique, with the city being called Lourenço Marques back then, still under Portuguese colonial rule. His father, Laurindo António da Silva Ferreira, a white Angolan railroad worker, died from tetanus when Eusébio was still an 8-year-old kid. It was up to his mother, Elisa Anissabeni, a black Mozambican, to raise her four kids on her own. As a little boy, Eusébio didn't seem to mind too much the poverty he lived in, as long as he could play football with his friends, often while missing school. Barefoot, and using an improvised football, young Eusébio would spend hours at Mafalala's 'football field', a simple open space in the centre of the neighborhood where he grew up. It is said that as a kid he used to be a fan of local club Grupo Desportivo de Lourenço Marques, a Benfica feeder team, which he tried to join, only to be turned down. Unlike them, Sporting Clube de Lourenço Marques, Sporting Lisbon's feeder team in the city, opened their arms to young Eusébio, and it was wearing their jersey from 1957 to 1960 that he attracted the interest of at least two huge European clubs, Juventus and Benfica. A Juventus scouter was the first one who spotted Eusébio when he was only 15 years old, but when he tried to convince his mother to let him move to Italy, she wouldn't even discuss it. A couple of years later, when a Benfica representative visited and told her that her son could have a bright future as a footballer, she did give her blessing to that 'marriage', accepting a handsome (by the standards of that time in what was a very poor neighborhood) amount of money. It wasn't that simple for Eusébio to play for Benfica though, since he had been playing for Sporting's feeder team in his home city. Benfica had to come up with a whole 'movie-like' plan first to have him travel to Portugal, and then stay under the radar for several months, until the issue stopped attracting too much attention. According to reports, he was even given a code name, 'Ruth Malosso', which Benfica's people used, so as to attract as little attention as possible. It should be noted that before joining Benfica, Eusébio was offered to Brazilian side São Paulo, who missed the opportunity to acquire a player who would become a global football icon. Eusébio had been followed by an ex-Benfica player, Brazilian José Carlos Bauer, who let São Paulo know of his 'finding' in Mozambique. After their refusal to pay the money needed, Bauer turned to Benfica, who, luckily for them, did not make the same mistake. 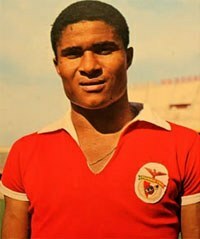 A "Panther" leading the "Eagles"
Eusébio arrived in Portugal in December 1960, aged 18, but Benfica avoided registering him until May. Once things with Sporting had calmed down, he made his debut against Atlético Clube de Portugal in a friendly game, in which he scored a hat-trick. His official debut was next month, in June, the day after Benfica had won their first European Cup, beating Barcelona by 3-2 in the final in Bern, Switzerland. Right next day, Benfica were scheduled to play a Portuguese Cup game against Vitória de Setúbal, the Portuguese Football Federation refused to change the date, so Benfica played with reserves. Eusébio scored again. Exactly a year later, aged 20, Eusébio not only was part of Benfica's first team, but he was one of the key figures in their 5-3 win in Amsterdam against Real Madrid, in their second successive European Cup triumph. Against Puskas's Madrid, Eusébio scored twice (the last two goals), making it clear that he had arrived for good. In his 15 years as a Benfica player, Eusébio, called "The Black Panther" because of his speed and his "killer instinct"' (at his prime, it took him just 11 seconds to run 100 meters), won 11 Championship titles, five Portuguese Cup trophies, of course the 1962 European Cup, and countless personal honors, with the Ballon d'Or in 1965 as proof of his "rule" in the sixties. A year later, in England's World Cup finals in 1966, he led Portugal to the last four (and finished as the competition's top scorer with nine goals), where they fell to the hosts in extra-time, in what was his best chance to go all the way and win a World Cup. Aged 33, Eusébio put an end to his Benfica career, but kept on playing football for five more years, mostly in North America. The number of goals he scored for Benfica depends on which games someone takes into account. Friendlies-included, he wore the "Eagles" jersey more than 700 times, and scored as well over 700 goals, most of them with his dynamite right foot, numbers that have not been surpassed ever since, and most probably never will. Eusébio died in Lisbon in 2014, aged 71, saddening millions of people in Portugal, his native Mozambique, and the rest of the world, both contemporaries of his who had the luck to watch him play, and younger ones who had grown up reading and hearing all about the legend that the 'Black Panther' was. His death was followed by a a three-day mourning period declared by the Portuguese government, while the remains of "the best player of all times", as the late Alfredo Di Stéfano called him the day he died, were moved to the National Pantheon (Greek for "all Gods") in July 2015, a place where only the most important of the most important Portuguese citizens are buried. The irony of this, is that it's a common secret that Eusébio faced racism as a black kid in his native Mozambique, and even at Benfica he is said to have been consistently discriminated against, earning less than his white teammates, something though, this whole 'racism' chapter in his life/career, that he always avoided talking about in public.